Although there has been several methods and algorithms in place to use for identifying objects, the lack of distinctive features and the growing nature of cells has made it difficult to identify them individually. Researchers have tried distinguishing cells based on their color but the indistinctive color differences between the same cancer cells has not been assuring. Haar cascade classification, a method used for detection and identification of objects which is used in many cameras as a face detector, would not be suitable for cancer cell identification since the machine learning algorithm needs a long time to process the images of the individual cells and by that time the cells would change shapes, divide, or die. The Speeded-Up Robust Features (SURF) algorithm is able to address most of the deficiency of other algorithms in identification of objects. It is not solely relying on the colors of cells and is rotation and scale adaptive. SURF also enables real-time identification as it can run about 4.5 orders of magnitude faster than SIFT. 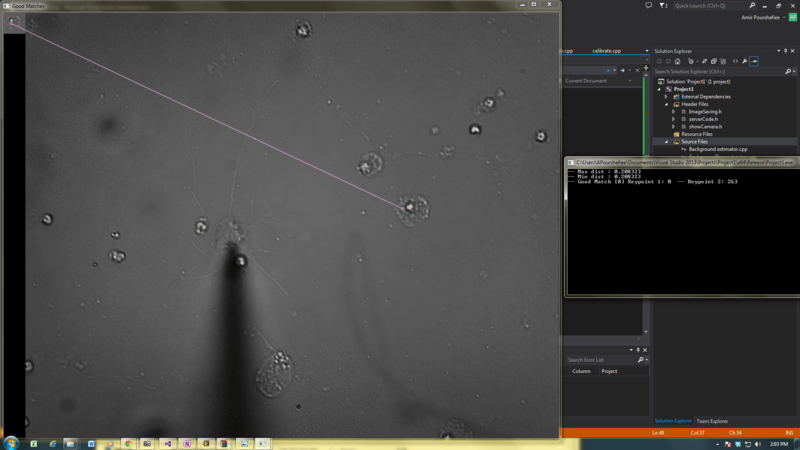 By implementing the SURF algorithm, we have been able to identify cells as shown in the image below.